A while ago I came across a recipe for a hot sweet onion dip that sounded interesting. I had never really paid much attention to onions as they are not usually the star of the show and I could not recall having ever tried a sweet onion. I normally just use the basic yellow onions in cooking and some red onions for salads. The other day I noticed that they had some vidalia onions that were labeled as sweet at the grocery store and I picked some up right away remembering this recipe. 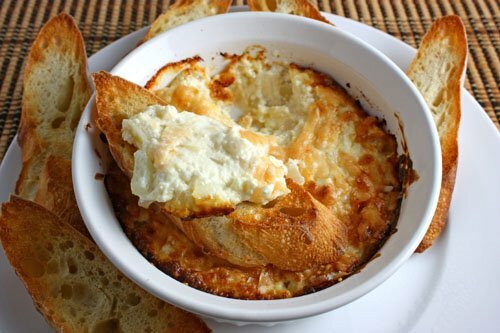 This dip was super simple to make; you just mix everything and bake until it is golden brown and bubbling. I really enjoyed the hot sweet onion dip! The baked onions were soft and tender and they actually were nice and sweet. The sweetness of the onions went really well with the rest of the creamy and savoury dip. I served the dip with some toasted bread for dipping and or spreading. I will definitely be making this again. Mix everything, place it in a baking dish and bake in a preheated 350F/180C oven until the top is nice and browned, about 30-50 minutes. OMG! this look savoury !! I’ve never been a huge fan of onions either, but the right onions, prepared the right way, can be amazing. This looks fantastic, Kevin! This would be great at holiday parties. Looks great! Wow, my husband will love this! Cheese and onion – his staple! I am a new visitor to your blog! Wow…I am so impressed. Your recipes are great, your photography is nothing short of fabulous. Thanks for sharing! This looks very sophisticated and would be a great addition to any party. Ooooh, that looks delicious. I love onions. Oh, and your nice crusty bread makes your dip look even better. I LOVE this dip! It is always a crowd favorite. Reminds me of an onion pie I make – Now that I have seen this – I am going to have to dip that recipe out and get my onion fix! Thanks! I am definitely going to try this! I love your blog and the pictures are so great! Thanks for sharing. yum! i don’t really cook with sweet onions a lot, either, but it looks delicious!! i’ll bet it’s a big crowd pleaser! This is bookmarked. Thanks Kevin. I love anything with onions & cheeses like French Onion Soup. I have to make this. Looks too good. This dip is screaming to be at a party. I’m sure it’ll be a perfect hit at any holiday party! I love sweet onions. I use it in everything. This dip looks super yummy. I will have to give it a try! Walla walla onions out of Washington are a yellow onion that really sweet also. But how can onions not be the star sometimes? That is like blasphemy. I make creamed onions at Thanksgiving with sherry and herbs. Who needs turkey. I love great homemade dips and this looks and sounds mmmmmmm. Interesting and flavorful! That dip is original! Love it, with the list of ingredients how could it be bad? It comes as no surprise that this dip would come from White on Rice Couple…good eye! Hi- I stumbled across your blog yesterday- I’m so impressed! I want to try every recipe- in fact- this onion dip recipe- does your ingredient list say “14 ounce pkg” of cream cheese or “one, 4 ounce pkg”? Thanks for clarifying! Sounds like a great party dish! Looks yummy! Another awesome creation here Kevin. That looks amazing. I, on the other hand, am an onion addict and will eat them raw, plain, stuffed and cooked. As a kid I used to pick them out of whatever they were in and save them for last (best for last!) I love the looks of this dip and am looking for something like this to bring to a t-giving party! Thanks! Yum. My husband loves onion dip – we may have to try this one soon. Oh I bet this was good, this is a great new dip to try! Oooh cheese and onion – yum! yum! this looks like a perfect dish for holiday parties. Yu really are into comforting dishes at the moment, Kevin. I love it! Kevin, that looks and sounds delicious! I cant wait to try it! What a great variation on onion dip. Your pictures are beautiful as well! Sounds great and looks delicious. The bread looks so nice and crispy! So simple and so easy – you made this looks GREAT! Yummy! This looks to be an easy and tasty dish that I can make for a tasty side to accompany dinner! It’s a completely improved Lipton Onion Soup Mix dip! I love it. Okay Kevin, this is one of my favorite dishes that you have made. Love the photos and the everything about this. My husband loves onion dip and insists on buying it in the jar, yuk! I am going to turn him around with your version! I am definitely trying this for my next get-together. I scrolled back thru older posts- lots of scrumptious food to try! Wow, this looks like such decadent appetizer! This is one great-looking dip! Love the fact that it uses onions as the star. This sounds delicious and perfect for the holiday season. This looks really good for the holidays! i love a good onion dip! I have a similar recipe for a Sweet Onion Dip and you are right, this is fantastic! Many years ago I ended up with a bag of yellow onions that needed to be used. I peeled them and set them in a baking dish. Poured melted butter over them, with salt, pepper, dill and baked in the over til tender. Topped with grated Romano cheese. They were THE HIT of the holiday dinner and so sweet. The sugar in the onions carmelized and they were excellent. I love onions! Just wanted to stop by to let you know I made this tonight and we loved here at home. I added a few fresh herbs and it was great. Thanks for sharing it w us! I just made this to snack on during the football game. So, so delicious! I blogged about it and gave a link to your blog so others can get the recipe. Thanks for posting such a delicious recipes. What’s not to love? Sweet onions, cream cheese, parmesan cheese, and bruschetta? Well, throw in a Friday night glass of red wine, some serious B movie on the SciFi channel and you’ve got yourself a memorable evening. I made this. Very yummy. I love grilled onions so I sliced thinly a very large New York candy sweet onion in a little olive oil, then added it to your recipe. It was very good. Thanks for posting the recipe. Love the sound of this dip…I think I will go to the grocery store this eveing. I wonder what it would be like to carmalize the onions before adding to the cream cheese mixture. Thanks for all your great ideas. Heather: The caramelized hot onion dip version is also excellent! Kevin, I lovvvvvvvvve sweet onion, I must absolutely try this. I still have so many readers remarking on your fabulous roasted red pepper and feta dip, and I never fail to credit you. I tis FANTASTIc. Today, in fact, I'm bringing it into a grad class as part of a presentation of healthy, creative snacks for kids. (Along with some homemade pita chips, of course)! Keep up the awesome cooking. You are such so talented! Hi Kevin: Sounds so good! and looks even better! A recipe to definitely do. But as I am not a fan of cream cheese I will substitute ricotta. I've done this for years…and mine is even simpler…chop an onion (any kind…sweet are good but any will do), grate a bunch of cheese (anything you like…those little smoked cheeses from Hickory Farms work great)…mix in enough mayo to coat, spread in pie plate, bake till bubbly and browned. Warning: must be eaten all at once as it separates upon reheating. A little sprinkle of chives or even parsley on the top would be pretty and add some color. This looks easy and delicious! !